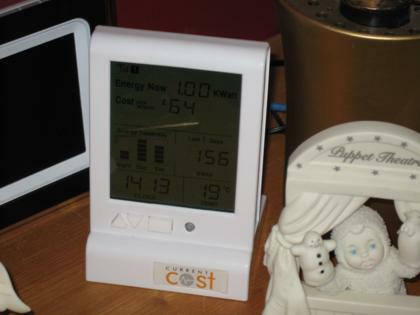 By itself the device works very well, providing an at-a-glance view of current power use and a history over several periods of time. There is a simple bar chart showing the relative amounts of power used in the previous day, split into day time, evening and night. 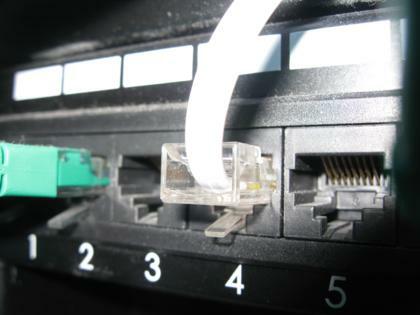 However if you want a clearer understanding of how power use changes day-to-day or even over a decade, connecting the device to a computer will provide the ability to store every reading in a database and/or produce live graphs of usage. Several people have written articles on how to do the logging, each using a slightly different method (and language) to do so. Most of them are for linux though, but any programmer should be able to port the ideas across to a different platform such as Windows or Mac OS. For my implementation, I followed this guide on jibble.org. Note that because I’m connecting via a USB port, the serial port name is different. The baud is also 9600 rather than 2800. I have set this script to run at startup (detatched from the console) so that it is always running in the background. I have also produced another simple script, which is run every minute as a cron job.� The script generates the graphs from the data stored in the RRD file, and uploads them to my web server via SSH. You can see the result on the Power page of this site. The graphs at the moment are fairly basic. The Jibble article includes some extra data in the graphs, which I will probably add at some point. For the moment though it does the job very well. The CC device is located downstairs, in the living room. Thanks to the serial output connector being an RJ45 socket, it was very easy to plug it into the exising CAT5 network (which I’m very glad I did) and run the signal to the cabinet in my room where it is then broken out through the RJ45 patch panel, through the RS232/USB cable and into the fileserver boron, which hosts the scripts. I’ve very new to this! CC128 arrived today, and I’m a Perl virgin. Is the script you post above the one you use for USB conncetivity? 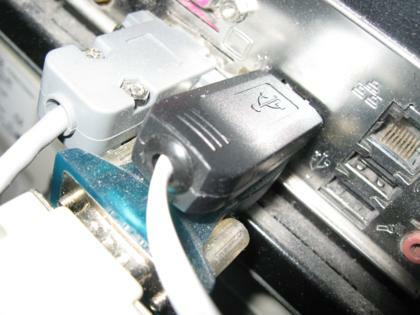 You mention “Note that because I�m connecting via a USB port, the serial port name is different.” What should the port name be for a USB connection? If you do ls /dev/ttyUSB* you will see what serial USB devices are registered on the system. If you’re lucky you will just have ttyUSB0, in which case subsitute “ttyUSB1” in my code for “ttyUSB0”. If you have others you may have to use trial and error, or something like lsusb to figure out which one is the correct one. Is the CurrentCost specific to 220v or can it be used for 110v? I strongly suspect that it only works with 240V/50Hz supplies, since it has to make the assumption that it’s working with that voltage and ferquency in order to guess the power (it only measures current). I’m pretty sure there are similar devices for 110V/60Hz supplies though, and there are more expensive devices which are more accurate which measure current, voltage and frequency.